The lumbar multifidus is probably one of the least talked about core muscles, yet it is one of the most important lower back muscles for core stability and the prevention of lower back pain. The multifidi are part of the deep stabilization core system. In Latin, "multus" means "many", and "findo" means to cleave". This muscle runs the entire length of the spine, but they are most prominent in the lumbar region. Because these muscles are so prominent in the lower back, they play a major role in stabilizing the lower back. Here is a basic over view of the anatomy of this deep lower back muscle. This muscle starts on the laminae of S4 (sacrum) to C2 (cervical spine/ neck). The lamina is the part of the vertebra between the transverse process and spinous process on the back of the vertebra. The fibers of each individual muscle span only 1-3 vertebrae levels and inserts on the spinous processes of the vertebrae 1-3 levels higher. When only one side is working at a time, this muscle will help to laterally flex the spine (side bending) or rotate the spine to the opposite side (i.e. the right side will rotate the body to the left). When both side work at the same time, it will also extend the spine (pull it backwards) or stabilize the lower back. 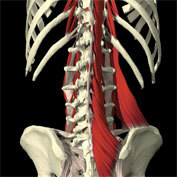 These muscles are supplied by the dorsal rami at various levels throughout the spine. Since this muscle plays such a large role in stabilizing the lower back, it will work during many lower back and core exercises. It will co-contract and work with the tranversus abdominus during the drawing-in maneuver and the plank to stabilize the lower back, and it will work during any lower back exercise that emphasizes lower back extension. Because it runs on an angle, it will also work with the abdominals during side bending and rotational exercises. Exercises like, medicine ball Russian twist place a little more emphasis on the abdominals because gravity puts more pressure on the abs when you lean backwards, but the lower back also works during this exercise. And exercises like side planks or side bends will also work both the obliques and the lower back muscles. If you only work your core moving forwards like during crunches, then you are missing many of the most important motions. To have well rounded core strength, include side bending motions, rotational motions, and back extension movements. Leave the Multifidus Page and Read About Additional Core Muscles.